It is from you, the reader, that I was given the idea to write this post about following the 21 Day Fix on a vegan diet – thank you…Please keep those questions coming! There are adjustments that you can make, mostly focused around the red container. But, there is also the blue container that we will need to take into account. Also note: I will be writing another post covering lacto-vegetarian and lacto-ovo vegetarian diets soon. As a vegan, there are two containers that will be affected: your red container and your blue container. Since this container is only used once each day for all calorie levels, I would not worry about the food list being small. Vegan, plant-based protein powders can simply be used in place of those containing dairy. These include protein powders that are made from pea, soy, artichoke, and brown rice to name a few. Remember that the original Shakeology formula contains whey protein, but luckily, the Vegan Shakeology formulas do not. They are a pea, oat, and brown rice-based protein blend. I actually just made the switch to the Vegan about four months ago as I have cut dairy from my diet after learning that it’s something my body tends to be sensitive to. To me, the Vegan Shakeology is better-tasting than the original, not as chalky tasting to. *You always want to try and choose foods that are nitrate free and are minimally processed. 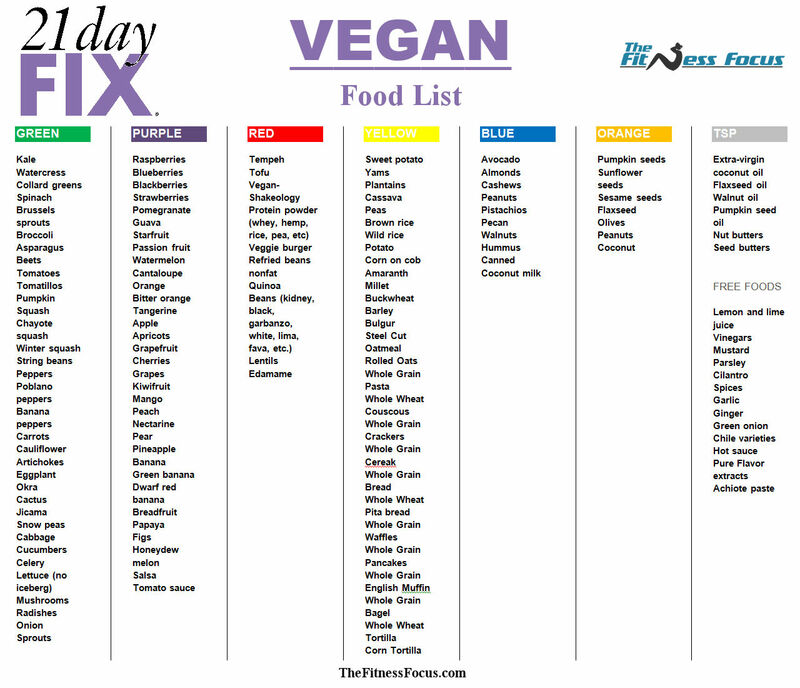 I realized that there is a an official Vegan Food List available with a Beachbody Club Membership(14-day trial with all workout programs included). This one also gives a few extra foods and serving sizes of odd shaped foods that do not fit well in the containers. Here is the link to a copy of the above food list in pdf format. Here is a link to a copy in microsoft word format that you may download and save a copy to edit yourself. Click here to download an excel version of the image above, you can the use this as template to plan your own week. 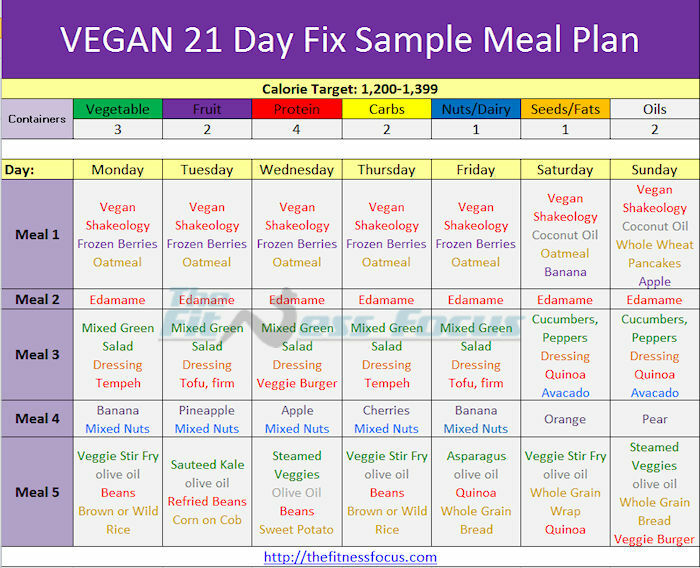 And if you don’t have excel here is a pdf version of the vegan 21 Day Fix meal plan. I’m not vegan, but have started doing Meatless Mondays. I’ve been wanting to try to eat less meat, and much of the research that I did for this article has inspired me to continue. But, if I missed something that needs a little further explanation or if you have experience with following the 21 Day Fix as a vegan, please leave a comment below. Thank you SO MUCH for putting this together! 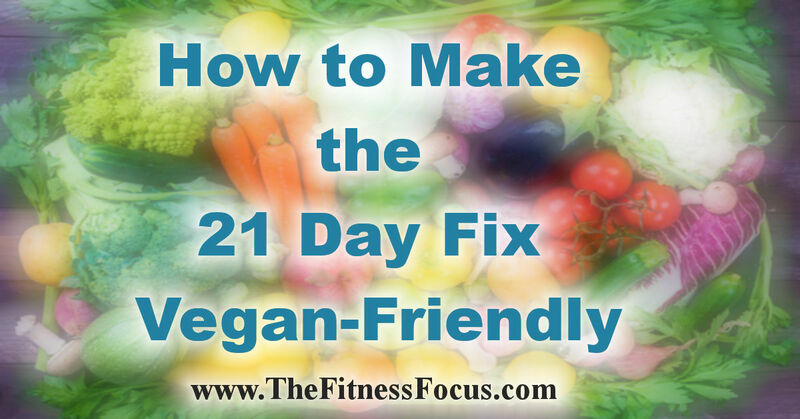 I have been a vegetarian for years, but recently committed to being vegan and was struggling with how to implement the 21 Day Fix eating plan with a vegan diet. I’ve been successful with the 21 Day Fix program in the past and am excited to see results again. This post saved me so much time and effort! Many, many thanks! Great tips and advise!! Thank you so much for taking the time to put it all together! I’m on day 5 and am amazed how full I am at the end of the day with the lowest calorie bracket. Due to injury I decided to start with the eating plan and gradually incorporate the exercises. Day 5 and I’m already down 2.5 lbs!! Can’t wait to see what happens once I can do the full program. Thanks again and keep it up. Awesome! And you’re welcome! Thanks for commenting. Hi Li, Good catch on the error. I will update thank you. Is there a gluten and dairy free list or some recipes for breakfast you could share? Do you have a PDF version of this vegan meal plan that I could print? I don’t have Microsoft Office, but would like to use this as my foundation. Hi, thank you for your meal plans. Do you have any meal plans that do not use meat substitutes? And you mentioned a vegetarian meal plan. Can you send that to me as well? Hi thanks so much, the funny thing is my vegan meals are quite simple and very similar to this. I do eat alot of raw veggies with my meals instead of cooked. But I enjoy cooking them too, 21day fix has definitely changed my relationship with food. Hi, thanks so much for this information. I’m a pescetarian (vegetarian who occasionally eats sea food) and I’m day 5 into the 21 day fix plan. I have been having trouble getting all 4 of my protein servings in based on the original protein list unles i eat a ton fish. This gives me a ton more options! My question is, if edemame is a protein do I eat the red container amount or do I eat the yellow container amount but count is as eating a red container? I found a list similar to this one one Beach Body’s website but it has you fill the yellow but count it as red. Thank you so much for posting this! I’ve been eating clean for a while now, but my portion has always been a guesswork. With this container system I’ve found out that I waaaay under-eat especially on protein. It is a struggle to even meet my target of 4 red containers per day (and I don’t quite fill up other colours either). I do eat meat but I don’t love them that much. If I count beans as my red ones, does it mean that I’ll have to fill up an extra yellow as well? Wouldn’t that make my starchy carb intake too high? Do you think I can have a bit more milk than stated in the book and count that as a red instead? I’m so skeptical when it comes to adding more food into my plate. Too many questions but this got me evaluating my whole relationship with food.